Autumn is upon us and Halloween is right around the corner. Families from across the country are gearing up to celebrate with costumes and the fun, familiar tradition of trick-or-treating with the kids. 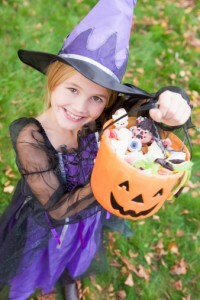 While you certainly can’t have Halloween without candy and other sweet treats, we do think that this is a great opportunity to emphasize the importance of preventive dentistry. At the office of Dr. Allan S. Mohr in Massapequa Park, NY, families from throughout Long Island and the surrounding areas are invited to protect their smiles from disease and decay with preventive dental solutions. While general dentistry checkups serve as the cornerstone of good oral health, there are certain times of year that warrant extra attention when it comes to little smiles. Your child’s Halloween haul presents a twofold problem: First, kids usually bring home much more candy than they can finish in just one weekend. This means that there’s a constant source of sugary, sticky treats within reach for weeks, increasing the amount of time your child’s smile is in contact with cavity-causing substances. Secondly, the most popular types of Halloween candy – including chocolate bars, Tootsie Rolls, caramels, taffy, and lollipops – tend to either stick to the teeth or remain in the mouth for extended periods of time. Both of these factors contribute to the development of cavities. Fortunately, there is a way to help protect your son or daughter from tooth decay. In addition to brushing twice per day and flossing at least once daily, schedule an appointment with Dr. Mohr and ask about preventive dentistry solutions like dental sealants and fluoride supplements. Dental sealants help to protect hard-to-reach surfaces, reducing the chances of cavities on molars and premolars. Fluoride supplements effectively remineralize enamel so that it is better equipped to handle the onslaught of acid produced by bacteria in the mouth. Both treatments are completely safe and pain-free. Dr. Mohr loves working with children, ensuring that good oral health habits begin early. If you’d like to learn more about how preventive dentistry can help keep your little one’s pearly whites healthy and safe from decay, contact our office today to schedule your next visit. Our caring, gentle team looks forward to providing everyone in your family with exceptional dental solutions that fulfill your needs and exceed your expectations. Our Massapequa Park, NY dental office proudly serves patients from throughout Long Island, Seaford, Wantagh, Lindenhurst, and more.